@synthi. By the way. If I look on your avatar, i see that you play the Hang or Bell with a kind of sticks. You are free to use your Hang in a way you want. But maybe it is not so easy to see a difference between Hang and PAN with this technic. What does "pan" in "handpan" mean? Is that all you have to say?? attacking me? Do you know my technique? do you know my knowledges? Back away from the keyboard for a few moments. Understand that the person on the other side is not attacking or the enemy, or 'wrong'. Take in that everyone's coming at this at a different angle. Funky, you are trying to be very clear that the Hang as a creation is a clear break from the tradition of the Pan, and you are clear that the creators of the Hang are very specific about the differences and distance. Synthi, you are trying to be clear that there is a community and general voice on the subject, also that the categories (as general catagories) are not based upon 'nothing' and not 'pulled out of the air' but can be seen as valid from a certain viewpoint. IXKeys, to answer the question you ask, it would depend on who you ask. For me the 'pan' part of HandPan is one that is applicable to the form and to the ancestry. Not 'exactly' but 'generally'. Since Funky´s last argument is a judgement on my person, I can see the arguments are taking a different point: personal attacks to a person with a different point of view. I could argumement better things about Frank, but I think that is not the point, and also remember: I`m a gentleman. Ix, The "pan" part in the "handpan" means nothing for me, is the whole word "handpan" what have a meaning. Thats my point. He thought that an avatar shows something important of the forum member, and so he thought that you play the Hang not only with hands but with sticks too. The Hang is a harmonically tuned sheet steel instrument. Using sticks and exciting the high energy level of sheet steel vibration one can produce sounds similar to the steelpan. Funky wanted to say: If somebody uses to play the hang (not only but sometimes or often) with sticks, he sees in the Hang something different as the creators of the instrument see in the Hang: It isn't made for high energy exciting with sticks but for low energy exciting with the hands. The adequate energy level went lower and lower from generation to generation. The conclusion Funky draw from this thoughts is, that someone playing the hang with sticks can call the Hang a handpan because he see it as a pan. But the Hang isn't built to be a pan. Therefor an adequate category cannot be handpan. Without the new instruments we see Steelpan and hang belonging to the same upper categories of "Tuned sheet steel instruments" and "Harmonically tuned sheet steel instruments". Under these categories there is to differentiate between Steelpan and Hang. Now two new instruments appear: The Halo and the Bellart Bell. The Halo creator invented for his instrument the Category "Handpan". The Bell creator didn't say something to this topic as far as I know. Now the question is: Where do the Halo and the Bell belong to? To the world of pan or to the world of Hang? I think if the Halo shall belong to the world of Hang, it cannot longer be a handpan. But if it belongs to the world of pan, its category handpan is adequate. But in this case the Hang doesn't belong together with the Halo to the category handpan. 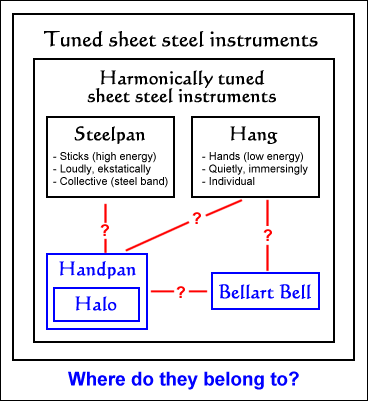 Also the Bell creator has to think of whether his instrument belong together with the Halo ("handpans") to the world of steelpan or with or without the Halo to the world of Hang. This decisions have consequences to the further developement of the new instruments. Than my question is: What is the meaning of "handpan"? Guys It’s a shame we cant all meet eye to eye as I know this discussion would be a lot easier with more understanding. Shame the “personalities” don’t come over in the posts as having met a few of the forum members in person (at the Hangout) it has given me a better understanding of who people are and what they really mean. That is an arbitrary visual arrangement based on your viewpoint. I could draw a similar arrangement where the Caisa fits in a box with the Hang (both convex). This doesn't help clarify anything. Now two new instruments appear: The Halo and the Bellart Bell. The Halo creator invented for his instrument the Category "Handpan".
. Kyle didn't invent the term for his instrument. It was a categorization that was adopted by several folks (myself included). I think by resting this on Pantheon it is straying from the intent to clarify. Another arbitrary deliniation based on your viewpoint. I think that several folks here have made the point that categorization does not rest upon the maker, it rests upon the general use and community. I dont see your problem in this point. I have nothing against you personally. Can you show me only one point where I was personally? It is a very big difference to discuss behavior or opinions or make a judgement on a person. I only see your avatar, and it is not clear which instrument, you or another person, play with sticks. But to play with sticks on instruments like Hang, Halo or Bell shows that you maybe want more the "steelpan way". Ok, you say it is a Caisa. In this case you do the best, what you can do with this instrument. Sorry. I dont understand, why you crying for Ixkeys. But read, what Ixkeys anwer was. He got the point. Nothing was a personally judgement. But it must be allowed to have arguments. Funky, to be fair, you must admit that you made an unfair assumption of synthi's playing style and also skill level based on looking at a photo. It is not that hard for someone to make the leap that your words were less than kind, and not hard to move from that thought to feeling attacked. Show some compassion and empathy, and you'll find these misunderstandings de-escalate instead of escalate. Funky, to be fair, you must admit that you made an unfair assumption of synthi's playing style and also skill level based on looking at a photo. but this was not a judgement again a person. It is a diffent thing to judge "playing with sticks on a Hang" or judge a person personally. If anybody play a Hang with sticks, it shows me that this person have different things in mind, what a Hang is. It says to me, that this person use the Hang like a Steelpan. Try out, how your Hang sound with sticks. It is easy to hear, that the instrument is not made for this playing style. It is a Style how to play a Steelpan. It is a style how to play a PAN. Not far away you have a Handpan. But this has nothing to do with personally judgement. I am far away from this. Ix: now I see you position, is clear that you´ll be defending Frank, no matter what he say or do. OK, now I see the way this forum works. Frank: Yes, you made a judgement about my way of playing based on a photo, and since you are speaking about me (no matter if you judge my personality, my technique, or something else), and ME is personal, because you are speaking about ME. I take your excuses, but reading your reply I`m not sure if you apologize because your error, or because you sorry because you made to me. I see this topic will go nowhere. For me is clear the intentions of Funky and not sure about IX, no matter what they say. It has been sugested by other members, and now have been proved. I understand that you feel that you were clear in your general indication that sticks and pans are different in tonal quality than skin on a Hang. But in your vigorous defense of your intentions, you are rolling right past the interpersonal impact that your words had on synthi. Buried in your most recent post is an indication that you did not mean to indicate anything about synthi directly, but can you see that the simple words posted can appear as a judgment of his skill level and therefore could be considered a very real and hurtful slight against him? If I were to tell you that, if you would just look up you could see that the cloudless sky is blue, you might see that as an assessment of your level of understanding. Also not to far of a stretch to see it as an indication on my part that you do not have the simple knowledge of that fact. That is an assumption on your part, but not one that is unreasonable for you to have come to. In a similar way the way you addressed synthi could be easily seen as less than kind, and he responded with affront. Generally the way to resolve issues is to admit that affront was not intended, and seek to re-connect. To defend one’s words can be seen as a challenge, and also an indication that the person who feels affronted wasn’t heard, or that their words expressed about what they feel are not valid. This leads to further separation. If that is your intention, then I will stop here, but it seems that is not your intention. Because it is based on my viewpoint it isn't arbitrary. What else than my viewpoint can I draw? I made this figure just to clarify things. I clarify in this figure what the main points are why I see pan and hang in two different boxes. Naturally you can find other points to group the instruments (convex/concav, colour, diameter or whatever you like), but in this topic it was important for me to clarify the main points. And in my figure of course the Caisa is in the same box like the Hang: The box "Harmonically tuned sheet steel instruments". And yes, you can draw a box "Convex harmonically tuned sheet steel instruments", but this figure wouldn't help clarify anything. Just a word to my viewpoint: It's not only my viewpoint. It is also what I understood from PANArt's point of view why they don't see the Hang as a handpan. I think it could be helpful if one of the proponents of the handpan term draw another figure to make clear what his main points are to group the instruments. This could really clarify a lot. Kyle didn't invent the term for his instrument. It was a categorization that was adopted by several folks (myself included). I think by resting this on Pantheon it is straying from the intent to clarify. I at first saw this term when Danny opened the "New handpan develpment" sub-forum in the Hang-Music Forum. And Danny told here in this topic that he saw it firstly at Pantheon's website. I wanted to make clear that each creator has to think of what his instrument should be. Therefor I drawed the Bell outside the handpan box, because I don't know a statement of Louis. It is important for the development, what a maker sees in his instrument. The differences I demonstrated in the figure between Steelpan and Hang was important for the development of the Hang from the 1st generation till today's IH. I think a well done categorization rests not upon the general use and community. It rests on people who take the trouble to really understand the instruments. And this is in this case extra difficult because the two new instruments aren't really in existence yet (only very few instruments were built and in the hands of others than the makers). So perhaps the time to categorisize isn't come yet and we should only speak about the Hang and "new Hang inspired instruments". I think a well done categorization rests not upon the general use and community. It rests on people who take the trouble to really understand the instruments. Perhaps this is a root issue. We're not really talking about a 'categorization' per say, as in the Sachs-Hornbostel system. We're talking about a general term categorization. So perhaps the time to categorisize isn't come yet and we should only speak about the Hang and "new Hang inspired instruments". The difficulty is that we're in such a nascent place with this that it can be categorized multiple ways based on your viewpoint. As you have said, if we go by the maker's wishes we have a certain categorization, form perhaps another, playing style perhaps another, and sound 'quality' perhaps multiple (based on the listener's preference). That being said, it is helpful to have a category that these 'things' go into, and handpan seems like as good a one as any proposed here so far. I'm not clear in my mind whether you addresses Ixkeys or Ixkeys Mod with your statement. By now I don't see the necessity that a moderator has to act. I think the involved members are able to solve the problem by themselves (if not a moderator will act). You complained that Funky attacked you, and now you formulated an attack against me (in my understanding and feeling). No problem. That's how forum disicussions sometimes go. I think you can bear the attack you feel and I can bear the attack I feel. In my answer to you I wanted to explain how I understood what Funky meant (not a personal attack). I wanted to show you the argument in Funky's post that you couldn't see. And to be clear: This doesn't mean, that I would defend Frank, no matter what he say or do. In this case I didn't defend him but tried to explain to calm the waves (but didn't succeed as we can see now). I think we are at a very interesting point of the discussion, perhaps the core point (if this is a possible term in English) of the discussion. If we want a helpful term "that these 'things' go into", why shall we use a controversal term that isn't accepted at least for one of the 'things'? If the use of the term spreads in a wider range it will not be canceled in the future. Therefor we have to think carefully about what we do now. How can we explain in the future why the handpans are no pans? "Hey this is a handpan, but it is not a pan." "Hääähhh???" "It is a pan, but played with the hands." "So it is a pan. It's only played by hands instead of sticks?" "No. It is not a pan. A pan is something very different." "So a handpan is not a pan that is played with hands?" "Äh..." "Why do you call it a pan if it is not a pan?" "Because it is such a nice short word." "And what is it?" "Ähh, it is a pan.... not a pan but... you understand... you play it with hands..." "But WHAT is it?" "It's a handpan." "???" Why not only speak of "Hang and Hang inspired instruments" when we want to address the group of instruments and use the individual names of the instruments when we speak about a single instrument? In the current stage of the history of Hang inspired instruments this would describe exact what they are and is consense. There is no need to relate to the steelpan because except the Caisa all other new Hang inspired instruments doesn't relate directly to the pan. They are not inspired by the Pan but by the Hang. And it is appropriate that the Caisa has a special status in the group of Hang inspired instrument because she really is a steelpan played with the hands. If it isn't necessary to relate to the pan, why use pan if this term is especial controversial?